Skydreams is celebrating their 3rd birthday with a sweet lineup, and the launch of two records! Pop, psych/garage, electronic beats, and classic hits! 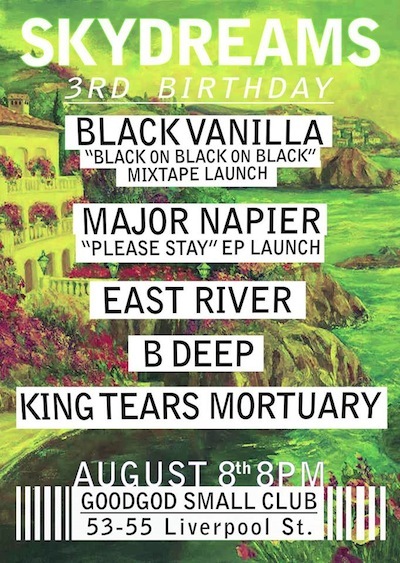 Black Vanilla launch their Black On Black On Black mixtape, the first release from this trio of “fascistic diva house overlords.” Featuring the vocal talents of Guerre and Marcus Whale from Collarbones with the beats of DJ Plead (Jarred Beeler). In the other corner, Melbourne’s Major Napier will release his pop gold EP, Please Stay.